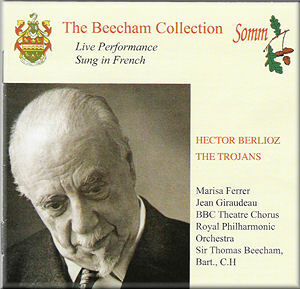 At last an official issue for the first complete recording of The Trojans - performances which were above all a massive act of faith in a work that had been only very rarely performed at that time. Indeed although Beecham was a tremendous enthusiast for the music of Berlioz and had first proposed performing the work in 1910 this was the first opportunity he had to present it, albeit in concert performances and with a few minor cuts that are irritating rather than fatal. Beecham had conducted extracts earlier, in particular the Royal Hunt and Storm and the Trojan March, but presumably these performances are the first time that he was able to tackle the bulk of the work. Most of the singers too must have been learning their roles for the first time, and the results are far from perfect. Overall they are nonetheless exciting and worth hearing, and the set as a whole represents an important part of the performance history of the work. Performed complete the work lasts for nearly five hours with intervals, so that it is unsurprising that the composer’s own division of it into two parts is still sometimes adopted. That indeed was what happened in these performances, which has the advantage that the second part opens with the Prelude that Berlioz wrote for such separate performances. One other minor oddity is the placing of the Royal Hunt and Storm as the second scene of Act 4, that is, after the love duet which the composer intended should follow it. The booklet states that this transference was the result of the conductor’s initiative. It is however in the position in which it is placed in older French scores of the opera, so that presumably Beecham was simply following the text available to him at that date rather than indulging in one of his characteristic bouts of performer’s freedom. It is indeed the conductor who is the main interest in these discs. The singing is of very variable quality. Marisa Ferrer gives highly dramatic performances as both Cassandra and Dido - I believe that she had sung the latter role in the theatre, but she seldom allows Berlioz’s wonderful lines to be heard as the sheer lyricism that they are. Certainly she sounds thoroughly involved in the drama but more recent performers have shown that it is possible to capture both aspects of the roles. Jean Giraudeau is even less satisfactory, with a weak tone that does not even begin to suggest the heroic character of Aeneas. All too often he sounds desperate in the wrong way. Other singers are generally adequate although the delightful lyric interludes offered by the songs of Iopas and Hylas are somewhat roughly sung. The chorus are clearly well trained even if at the great climaxes they sound less numerous than would be ideal. The glory of the set, however, is the playing of the Royal Philharmonic Orchestra and Beecham’s conducting. Conviction in the work is plain, and there is a real sense of adventure, of exploring new and exciting territory, in the forward drive of the performance. The recording is obviously of its period and at times is congested and with a very forward balance for the singers. Nonetheless I cannot imagine that it would put anyone off who was interested in exploring this mighty work further than the wonderful array of modern recordings now available. This is obviously not a first choice for a recording of the work but it is surely an essential supplement to one of those versions. Treating it in that way also overcomes the disadvantage that this set comes without a libretto, although there is a helpful synopsis and notes on Beecham and The Trojans. Some notes on the singers, many of whom may now be unfamiliar, would have been helpful but the important consideration is that this historically important and exciting recording has now been made widely available in an admirable transfer. No enthusiast for the opera should be without it.